RIC FLAIR AND SHAWN MICHAELS WITH A WOMAN FROM THE U.S. ARMY SERVING IN AFGHANISTAN. 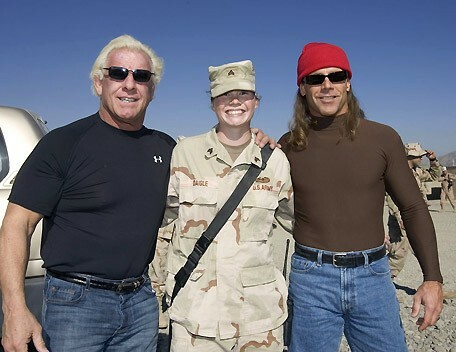 ANOTHER WOMAN SOLDIER FROM THE US ARMY WITH RIC FLAIR, SHAWN MICHAELS AND JOHN CENA. THE US ARMY SOLDIERS AND THE WWE SUPERSTARS WITH THE GREAT RED, WHITE AND BLUE OF THE UNITED STATES OF AMERICA.